…and sometimes it’s out of control. …and sometimes life imitates art. …the sincerest form of flattery. …turns out to be very rewarding. …only to have guests become a part of your exhibit. …but it’s all worth while in the end. 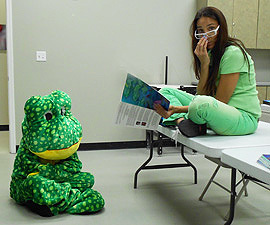 Although you probably never imagined yourself having to rehearse with a leap frog. Visit our Merchandise page to see Paintings, Prints, Sketches and More.